Maxwell (Mike) K. Hearn, Douglas Dillon Chairman of the Department of Asian Art at the Metropolitan Museum, joined The Met in 1971 to help oversee the expansion of the Chinese art collection and the addition of new exhibition spaces. Previous positions at The Met include the Douglas Dillon Curator for Chinese Painting and Calligraphy as well as roles as a curatorial assistant, research associate and assistant curator. Since 2011 he has served as department chair. 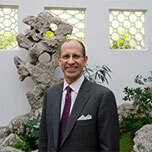 In addition to overseeing The Met’s expansion of the collection of Chinese art Mike was involved in major additions to many permanent gallery spaces, including the Astor Chinese Garden Court and the Douglas Dillon Galleries, both completed in 1981, and the renovated and expanded galleries for Chinese Painting and Calligraphy, which opened in May 1997. Mike has curated more than 50 exhibitions, authored or contributed to numerous catalogues, and taught graduate and undergraduate seminars on Chinese painting at Yale, Princeton, Columbia, and the New York University Institute of Fine Arts. He earned his BA from Yale University and his PhD from Princeton University, and was elected fellow at the American Academy of Arts and Sciences in 2014.